The temperatures are dropping which means it’s time for comfort food. I guess there is really never a bad time for comfort food, but when it’s dark and cold outside I think comfort food is a must. 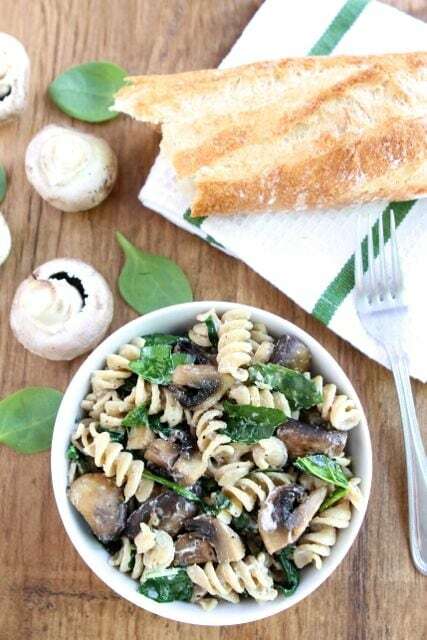 Pasta is one of my favorite comfort foods and this Creamy Goat Cheese Pasta with Spinach and Roasted Mushrooms is comforting to the very last bite. 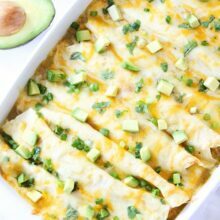 This is a great weeknight dinner recipe because it is easy to make and tastes so good after a long day of work. I also like that it is healthier than your average creamy pasta dish. I didn’t use any heavy cream or butter to make this rich and creamy pasta. The goat cheese melts in with the pasta creating a flavorful and creamy pasta dish. I also added some vegetables to bulk up the nutritional value and flavor of the pasta. 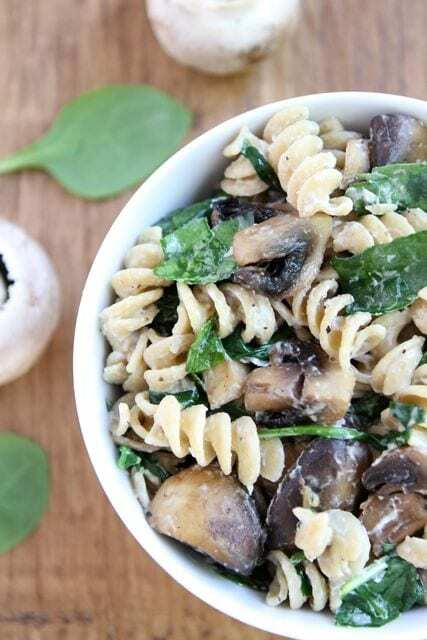 The roasted garlic mushrooms and fresh spinach are so tasty in this pasta dish. I sprinkled in some freshly chopped basil right before serving because fresh basil is always a good idea-especailly when it comes to pasta. 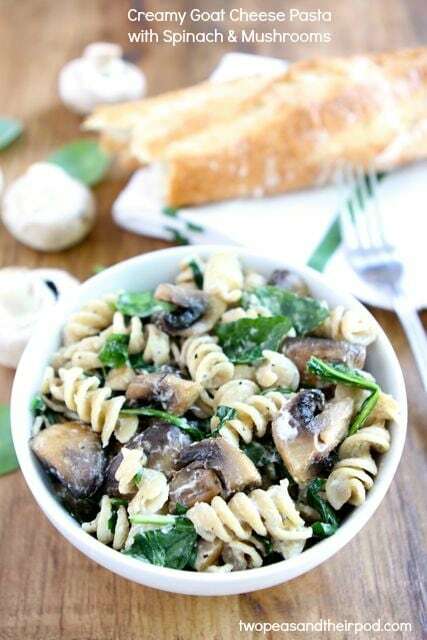 Add Creamy Goat Cheese Pasta with Spinach & Roasted Mushrooms to your dinner menu. 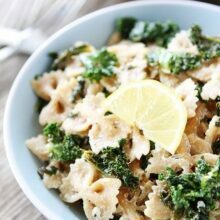 This easy meatless pasta dish is a favorite of ours and I think you will enjoy it too! 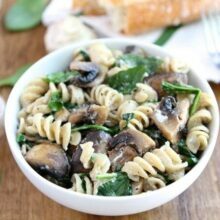 Creamy goat cheese pasta with spinach and roasted mushrooms. This easy meatless meal is a regular at our dinner table. 1. Preheat the oven to 400 degrees F. Place mushrooms in a medium bowl and drizzle with olive oil and balsamic vinegar. Add in garlic and toss. Season with salt and pepper. Spread mushrooms evenly onto a large greased baking sheet. Roast for 15-20 minutes or until mushrooms are tender, stirring once. 2. Cook pasta according to package directions, but before draining, reserve 1 cup cooking water. 3. 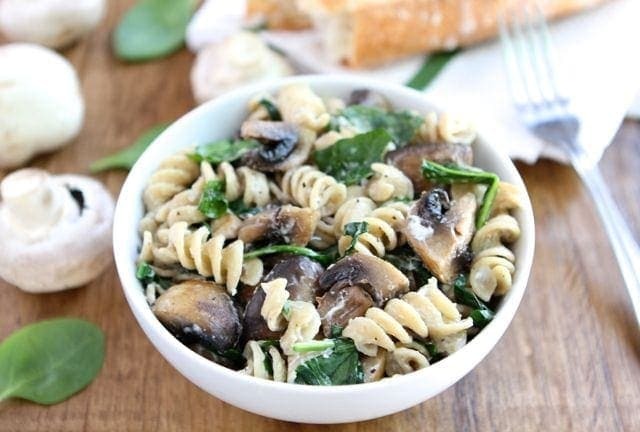 Toss pasta with roasted mushrooms, spinach, and goat cheese. Add in reserved cooking liquid and stir until the cheese melts and the pasta becomes creamy. Toss in fresh basil and season with salt and pepper. Serve immediately. This looks fantastic – I love the idea of using goat cheese for the “creaminess factor”. Ohhh yummy! I love that you used goat cheese! What a great salad! I actually have all these ingredients at home- making this!!! This looks delish! And I still have to make Aida’s oven-baked fried chicken! My kind of dinner- looks perfectly creamy and delicious. 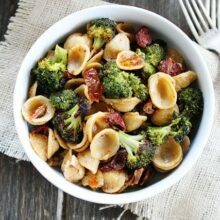 Love the flavors in this pasta recipe! I love any pasta dish with goat cheese – this looks great! HOLYYUM. i love roasted mushrooms, but the addition of goat cheese takes this over the top. need! I’m eating my breakfast, wishing I was eating this pasta! Perfect healthy comfort food…and who doesn’t like goat cheese????? I just love everything about this pasta!!! Cannot wait to make it! And WHY have I never roasted mushrooms before?!? I love pasta, but I love it even more with all those veggies! OMG, this pasta looks AMAZING! love it!!! What would you suggest if you hate mushrooms? This looks so delicious. What other veggie do you think might be a good substitute for the mushrooms? this looks SOOOOO good!!! I am obsessed with the goat cheese!!! I want this so bad it hurts me. I know I’d love this. I’m on a huge mushroom kick right now! I’ve also made that recipe of Kalyn’s that you linked to, yummy. And coincidentally, I posted a goat cheese recipe today too! The idea of melty goat cheese makes me hungry 🙂 I’m not a mushroom gal, but I think maybe some other green (broccoli?) would be awesome in here too! WOWZA! As one who is trying to support my husband’s successful weight loss, this recipe looks like a winner for him! BTW, I found you through Pinterest when I pinned your Twix Caramel Popcorn recipe! I switched things up a bit, using Milky Way bars, etc., and wrote about it here: http://www.iPinnedIt.com. These are some of my favorite flavors together, with my beloved pasta. Delish! I had to come back and share this on FB because I couldn’t get it off my mind! Love this! We’re huge fans of mushrooms and goat cheese, so this is right up our alley! Yum. My sister is all about the mushrooms but I’m not – sounds like it would be great with spinach and peppers too! This sounds amazing! I might have to add a little crumbled bacon. I can’t wait! Ooo! I love the colors in this pasta dish. I love spinach and goat cheese together, great recipe! This is just my favorite kind of dish! A big bowl of comfort! Yum! Goat cheese is awesome, isn’t it? This looks like the perfect homey delicious dish! FANTASTIC recipe!!!!!! I made as is. The best part is, is that all 4 kids loved it!!!! Definitely a keeper!!! Thank you!!! I had some roasted mushrooms in the fridge and we made this dish last night — yummy … enjoyed by all! Love this recipe. 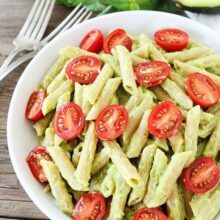 I’m a pasta fanatic – thanks for making it healthy too! It’s funny, I loathed goat cheese during my semester in France (a shame, I know) and now I can’t get enough of the stuff. I’ve learned to like mushrooms, too, and I know I would love this pasta dish! Oh, if only I had seen this on the day itself, it would have made a great birthday dish! Will definitely try this recipe soon. This is my kind of pasta! Puts my night of bread and cheese to shame. Just wanted to stop by and say I made this last night and it was delish. Super easy and flavorful. Thanks for posting it, it will definitely be a regular here at our house! This was really delicious – nicely creamy! I reviewed it on my blog. Thanks for a wonderful recipe! Made this for the first time last night and it was absolutely gorgeous. It was a very cold night in Melbourne, Australia and this dish was comforting and warming without being overly heavy. My carnivorous boyfriend (who I think ate KFC most meals a week before we met) loved it too! Thank you so much for sharing this fantastic recipe! This meal sounds like it was made just for me! Some of my favourite flavours all in one bowl… thanks for sharing! I made this for dinner tonight for myself and a friend. Neither of us could get enough. So Yummy!! Would this be good with a bean or lentil??? This dish is great, we have it about once every two weeks. Very tasty and quick! Thanks. This was really delicious! Thanks for the recipe – I loved the roasted mushrooms. I liked this pasta a lot — thanks for the recipe! I couldn’t find Crimini mushrooms, so I used portobello, and they were still great. I also didn’t have basil, but I liked the way everything tasted. Next time, I plan to add way more mushrooms — they were the best part, and more mushrooms and less pasta makes this a less carb-heavy dish. I would also add some lemon juice to the spinach before mixing — I bet that would taste awesome, since I’m a lemon juice fan. And I’m also going to sub half goat cheese for feta — it would still be creamy, but the feta has a bigger bite. I also would love to add artichoke hearts to this next time, too. I’m so glad I stumbled upon this recipe while scrambling to make dinner last night; it tasted as if I had planned dinner out perfectly. Thanks! This looked so delicious so I made it. Sadly, it was very dull and lackluster. It’s definitely missing something in my opinion to give it more of a kick – perhaps sundried tomatoes. I think it has way too much spinach. Maybe I didn’t add enough basil. Maybe I’ll try it again with some modifications because I love all of the ingredients. We made this tonight and it was delicious! I doubled the mushrooms and spinach just because and it was a huge hit! Just made this, but added mini-plum tomatoes. actually, didn’t follow recipe exactly for quantities etc, but hadn’t ever thought to roast the mushrooms first.